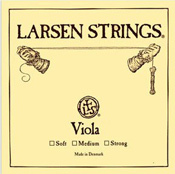 The Larsen A Strings have a solid steel core are ideal for use with most any D, G and C string. The Larsen A has become one of the standard choices of A string for professional players. Larsen D, G, and C strings have a nylon core.